Spark goes behind the scenes to explore the making of the San Francisco Opera‘s “The Bonesetter’s Daughter,” Amy Tan‘s libretto based on her best-selling novel. We follow Tan as she travels to China, searching for her own family history, one that resonates in the book and the opera. Then watch renowned sculptor Maya Lin install her latest work at the new California Academy of Sciences, a topographical depiction of the San Francisco Bay. Lin was catapulted into the public eye with her Vietnam Veterans Memorial in Washington D.C., but this is her first work in San Francisco. 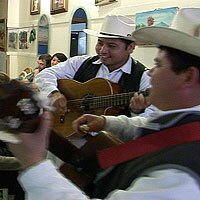 Finally, we trail street musicians Jacobo Palacios and Rafael Potillo, who go by the name of Los Cazadores del Sur, or “the hunters from the south.” The two troubadours strum their guitars and serenade Mission District patrons with popular tunes from all over Latin America. 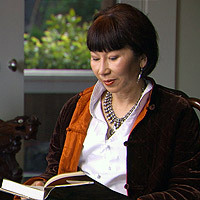 Travel to China with Amy Tan as she does research for the San Francisco Opera's production of "The Bonesetter's Daughter." Head to the Mission District, for a day in the life of Los Cazadores del Sur. 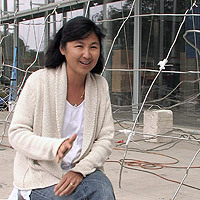 Visit the new California Academy of Sciences building with Maya Lin as she works on a site-specific sculpture.